So, let me explain the problem: You have that package shipped by DHL, and its tracking number. 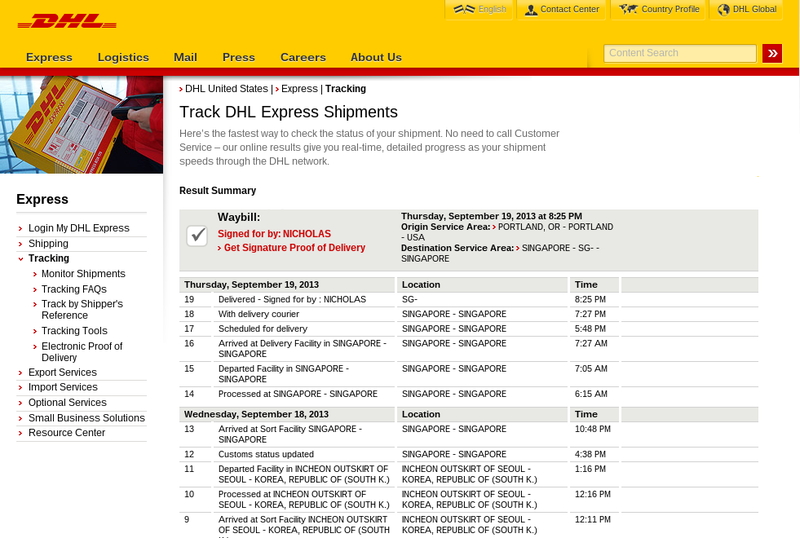 And you're so eager to receive it, that you end up checking the package tracking page every 5 minutes. Your productivity falls to zero. But, worry no more! Let's put the package status inside your conky, so that you can just have a quick look on the side of your screen, and continue working. conky is the information bar on the right on the display. CPU/RAM usage, disk free space, network status, temperature, a calendar, my DHL tracking thing, then weather in a few places. In case you wonder, and the background is somewhere in Hue, Vietnam. And don't worry about the gimp error, really. Ok! After all the point of this was to increase your productivity, right? You can fetch the script from my github. Where <AWB> is the Waybill number (tracking number). It produces a text-only tracking information for your package. 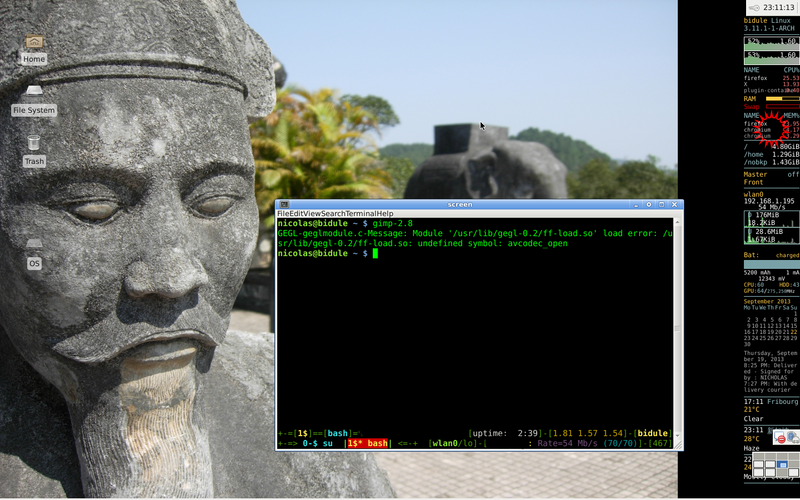 Replace ~/.conky/dhl with the path to where you copied the script. Change head parameter if you want more lines, and fold inserts new lines every 16 characters (change that depending on your conky width). Now, if you want to know how it works, so you can fix it if it breaks, or update the code for other shipping companies, continue reading. The next thead shows the date valid for the following entries. We are only interested in the first column here (the one that contains the date). Finally, the bulk of the events are enclosed in tbody. The first column is a incremented number, the second one is a description of what happened (passed customs, arrived at destination, etc. ), the third one tell you the location (but this is often repeated in the description), and the fourth one is the time. Ok, now we have an idea of the structure, let's parse that! Nothing special here, apart from the text output mode, so that xsltproc outputs a text file (and not another XML file...). Now begins the fun. We look for a table with summary attribute 'Summary of table content'. Inside that table, we look for thead and tbody elements, that do not have a class attribute set, so we can exclude the 'tophead' row, that we are not interested in. For thead, we just want to show the date, that is the first th inside a tr (tr/th). Then we print a new line with xsl:text. For tbody, it is slightly more complicated. First, we check that the first column is indeed a number (this removes the last row in the table, which is another type of summary): this is done with a "trick" (floor(tr/td) = tr/td). Then we print the time (4th column), followed by a colon, and the event description (2nd column). That's it! Then you can put everything in a shell script, see the complete code on github for details. It's so cool, I want more! I get it. I, too, have become of fan of parsing XML/HTML from scripts. See this post for another example.